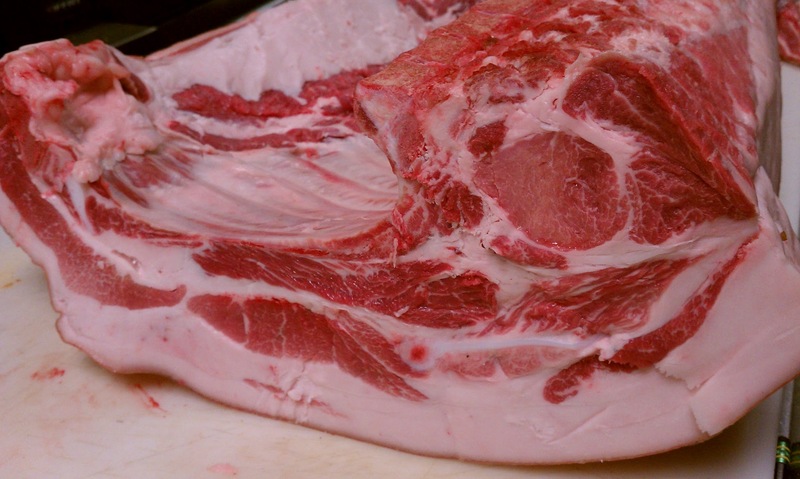 This is the latest whole hog we received from our farmer Sam Yoder of Jolly Barnyard Farm in Kentucky. The pig itself is a mix of Landrace and Large White hogs. Both are very old European breeds brought to the United States in the 1800’s. It has to be one of the best crosses I have ever worked with. This picture is the cut I made between the fourth and fifth rib. What we yielded from it was 15 of the most beautiful chops (both bone in and out) that I have ever had. We seasoned them heavily with salt and black pepper and individually bagged them with pork stock(made from the bones of the same pig) and thyme. Then we sous vide them at 56.5 Celsius for 4 hours. Once done and chilled we pan-fried the chop in lard (rendered from the fat of the same pig) until crisp and hot. The result was the best pork chop I have ever had in my life. The meat was as tender as ever and cooked only to about medium. The flavor was truly pork in every way imaginable. I do have to say that for the bone in chops we left all the meat and fat on the bone, meaning we did not french cut it in any way.